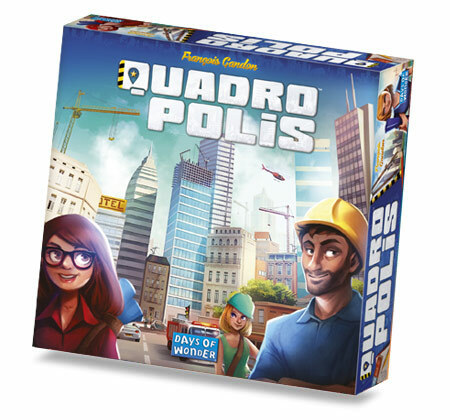 With Quadropolis, become the Mayor of your own city! At this hour, most of your citizens are going back home, heading for the tall buildings that you see in front of you. Some others are still wandering in the parks and gardens with their kids, and others decided to go shopping in the new mall that you opened a few weeks ago. 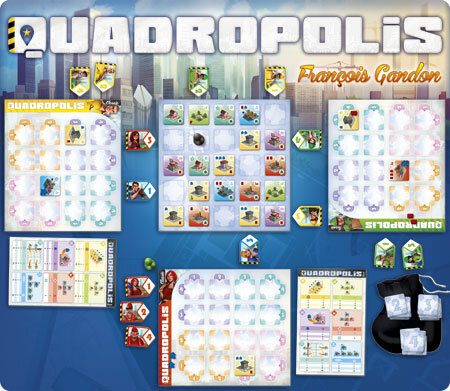 Winner of the International Game Designers Contest of Boulogne Billancourt, Quadropolis is for 2 to 4 players ages 8 and older and takes approximately 30-60 minutes to play. It includes 142 Building Tiles, 1 Construction Site Board, 4 Player Mats & 4 Helpers, 20 Architects, 65 Inhabitants (blue meeples) & 50 Energy Units (red barrels), 1 Urbanist & 1 Mayor Figure, 1 Scoring Pad, 1 Cloth Bag and 1 Rules Booklet. Quadropolis is expected to be available in Europe early March and in the US early April at an expected retail price of $50/€45. This entry was posted on Tuesday, January 12th, 2016 at 15:08 and is filed under Big Adventure Games, Games, News. You can follow any responses to this entry through the RSS 2.0 feed. Both comments and pings are currently closed.